Heat oven to 350°F (325°F for dark or nonstick pan). Make and bake cake as directed on box for 13x9-inch pan. Cool completely in pan, about 1 hour. Pierce cooled cake all over with fork. In small bowl, stir gelatin and boiling water until smooth; stir in cold water. Pour over cake. Run knife around sides of pan to loosen cake. Refrigerate 2 hours. Frost with whipped topping; garnish with raspberries. Store covered in refrigerator. Use any flavor of gelatin that you like for this recipe. 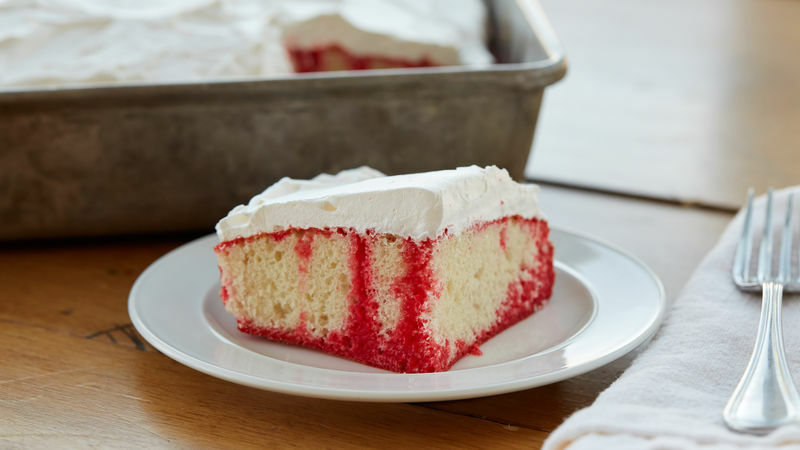 Try strawberry gelatin and garnish the cake with strawberries, or experiment with strawberry-banana, strawberry-kiwi or sparkling berry gelatin. You can also whip your own whipping cream to top this classic recipe. In chilled medium bowl, beat 1 1/2 cups whipping cream and 2 tablespoons granulated sugar with electric mixer on high speed until soft peaks form.